Book V of Marcus Aurelius’ Meditations begins with this famous passage: “In the morning, when you rise unwillingly, let this thought be present: I am rising to the work of a human being,” followed by a (perhaps unintentionally) humorous comment to the effect that yes, one would prefer to stay warm under the blankets, because it is more pleasant, and yet we were not made for pleasure (a slide at the Epicureans?) but to do the work of a human being, which largely means — for the Stoics — to be useful to society. At #3 Marcus reminds himself to ignore the disapproval or criticism of others if he knows that what he is saying or doing is the right thing to say or do. This sort of passages are often misinterpreted by critics of Stoicism as indicating an attitude that can lead to dodge criticism and embrace one’s own biases. 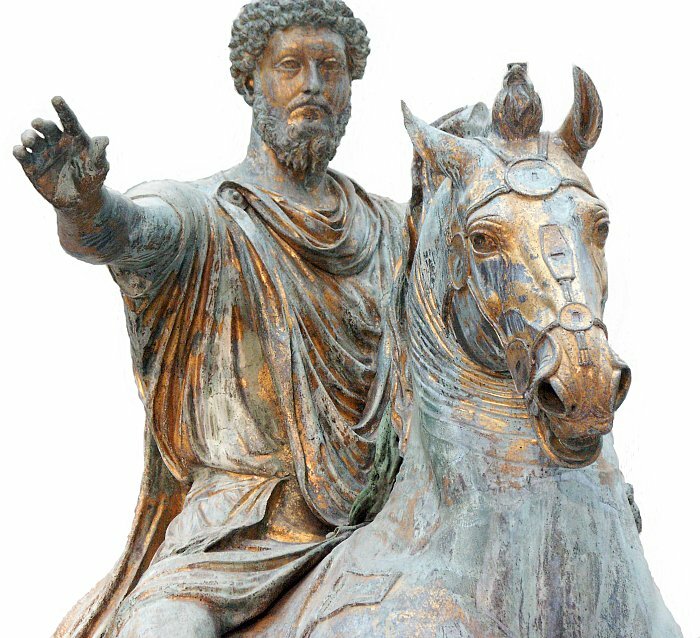 But since the Stoics, including Marcus and Epictetus, very clearly state elsewhere that the wise person does learn from good criticism, this isn’t the intention: the idea, rather, is to go on along one’s path despite petty and unwarranted criticism. At #6 Marcus talks about our duty to behave as social animals, and to do it not for the sake of praise from others: “a man when he has done a good act, does not call out for others to come and see, but he goes on to another act, as a vine goes on to produce again the grapes in season.” I quite like the image of a vine that does its work without need for praise from others. At #8 he engages in the sort of discourse I cannot concur with, as he invokes the Stoic idea of cosmic Providence, according to which things in the universe occur because of the general good, even though not necessarily for the good of any specific individual. Marcus draws a parallel with being treated by a doctor, who may prescribe a harsh and unpleasant cure, just like nature may “prescribe,” for you to loose a limb or get seriously sick. Jumping to #16, Marcus sounds a bit like a modern cognitive behavioral therapist, making a link between the quality of one’s thoughts and the quality of one’s “soul” (or character): if you want a better soul, remind yourself to engage in good thoughts. The topic of suicide is a recurring one in Stoicism, and the Stoic approach is, I think, still very much valid today. I expand on this theme in this presentation I gave earlier this year at Columbia University. This entry was posted in Marcus on July 30, 2015 by Massimo. Hi Massimo. The link to your Stoicism & Death presentation appears to be broken. Thanks for this, Massimo. I look forward to your commentary on the pro-Providence and pro-Atoms essays. Forgive me if I’m jumping the gun on your commentary on these essays, and that you have not yet gotten in you review of Meditations to Marcus’s section VII where in the last entry in the section he gives advice on this matter, but here’s a swing I took a few years back at understanding his cryptic advice at the end of the entry: http://jameselassiter.blogspot.com/2011/09/from-unknown-into-uncertainty.html?m=1. I’m not sure I still feel the same way about his advice after reading you and others on Stiicism over the past six months. Maybe, he’s right. It could be either providence or atoms and our best course is to remain open to either possibility. Thanks again for your tireless work on SciSal, Stoicism, and all the other matters you attend to. I’ve learned much and Stoicism has been a great help for my seeking, navigating, and coping within the ethnosphere. Thanks James, I’ll definitely take a look! Regarding Chapter 28 and the man with poor hygiene, wouldn’t the stoic approach be simply to ignore it, to recognize that it is the judgment we make of the man that truly bothers us, and not the bad smell? I prefer the advice given in Book 9, Chapter 20: “You should leave another’s wrong where it lies.” A few passages earlier he explains how it would be possible to tolerate someone’s bad hygiene: “Today I escaped from all bothering circumstances – or rather I threw them out. They were nothing external, but inside me, just my own judgements.” (9.13) Certainly I think this approach is the surer path to inner tranquility and social harmony. Gabriel, I appreciate your points. But I still don’t find much to fault in #28 here. Marcus is simply recognizing that certain behaviors are not socially acceptable, but that getting angry about it doesn’t do anyone any good, especially yourself. One must therefore find ways to address the problem, rather than getting mad at it.